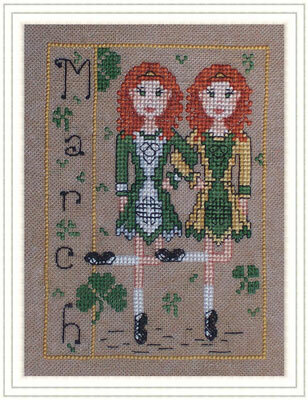 Double your luck of the Irish this March with Margaret and Meghan (Maggie and Meggie) O'Garland. Maggie and Meggie pull pints of eggnog at the Frosty Snowman Pub, which has been owned by the O'Garland family for 5 generations. These lovely lasses are best friends as well as twin sisters. They enjoy bicycles built for two, synchronized swimming and singing sad Irish ballads. In their spare time they knit hats, scarves and mittens for misfit toys and less fortunate snow people. They also teach traditional Irish dance classes every other Tuesday at the Igloo Community Center. Maggie and Meggie agree that the perfect date is a double feature followed by a double cheese pizza with their favorite lads Tommy and Timmy McTinsel, owners of the Polar Star eggnog brewery.